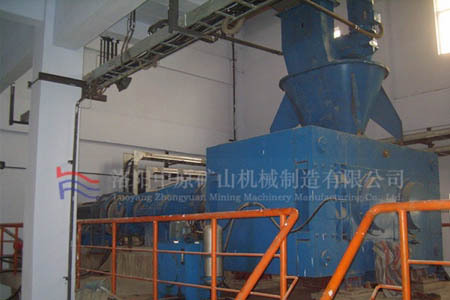 ZY mining Briquetting Machine make your manufacturing operation easier, cleaner and less wasteful. Copper shavings, chips, turnings and filings take valuable space, time and resources to deal with. Recover valuable copper scraps with ZY mining Briquetting Machine. Metal scrap ball press responds to the national environmental policy, is a kind of machine, that press the adhesive added metal scrap like copper scrap, iron scrap, and aluminum scrap into briquettes. The initial strength of the final briquettes is quite good, which is conducive to recycling. The metal chip ball press plays an important role in the molding process, and the roller assembly is the core part of the machine. The two pressure rollers have the same diameter and the axes are parallel to each other, and there is a certain gap. There are hemispherical sockets with a regular arrangement, the same size, and a uniform shape on the roller sleeves. When the motor starts running, the rollers start to rotate at the same speed and in the opposite direction. When the material passes through the junction of the double rollers, it is subjected to pressure and the volume is compressed and becomes smaller. The metal chip ball press presses various scraps of metallurgical industry such as copper scraps, iron filings and aluminum scraps into balls, avoids oxidation, reduces packaging costs, improves product transportation capacity, and achieves waste utilization and pollution reduction. Hydraulic station is placed independently and can be automatically started and stopped, and the pressure is also automatically controlled.